Last edited by TypingChicane on Sat Sep 16, 2017 9:56 am, edited 1 time in total. Not confident at all but need to give myself a chance in the cup. Could also go Ricciardo, Vettel, Verstappen which if correct would give me the win on seeding I think, but screw it. C'mon Ferrari don't let me down! Let's see how the race turns out. Don't worry, I'm pretty sure nobody scored more than 3 points, so you didn't really take a big hit. Results will be coming later, after I stop raging about the results. It looked so good after qualifying. The result is that Sebastian Vettel has thrown away the championship, and with it the hopes and dreams of not just the Tifosi, but everyone who wanted a competitive season to the end. Oh, you mean the results of this competition? Well, that was a bit simpler, and far less significant for the championship. Everyone who picked Ricciardo for second got 3 points; everyone else got nothing. Not surprisingly, with only four people scoring points - and even those four only scoring 3 a piece - there was minimal movement in the standings. However, with the points as tight as they are right now, every point matters - and every entrant who scored points moved up at least one place. TypingChicane moved from third to second, only 3 points behind mcdo for the championship lead. Black_Flag_11 moved from eighth to sixth, tied on points with Jezza13 but ahead on tiebreakers. Icemanjee1 moved to 5th, tied on points with Exediron but behind on tiebreakers. Fountoukos13 moved one place past the not-entering theferret. In the team standings, there was even less movement. One of the scorers isn't part of a team this season (TypingChicane), and one of them is on a team that had too big of a gap in front (Icemanjee1). The other two, however, are on the same midfield team, and they gained significantly as a result. Defending champions Mind Your Manors move from 7th to 5th, and now sit only 13 points outside a repeat championship. Just like Sebastian Vettel's championship hopes. ... says he who holds the top spot in two competitions where I'm in second. So yeah, likewise. So, the Knockout Cup quarter-final stage is complete. Remarkably, all four of those who actually managed to score any points in Monza were still in the Knockout Cup, so despite it being a race that proved almost impossible to predict, it did have an impact on the semi-final line-up. Fountoukos13, our lowest remaining seed, put up a valiant effort against the #2 seed Icemanjee1, but ultimately couldn't repeat the heroics of the previous round and exits the competition at the quarter-final stage. Both competitors actually managed to score points in Monza, although obviously that means their scores simply canceled each other out. Fountoukos13 can take a degree of comfort in the knowledge that even had Icemanjee1 not scored, three points wouldn't have been enough to advance. Likewise, the low-scoring round scuppered whatever slim hope Black_Flag_11 had of avoiding a minor upset at the hands of lower-ranked Exediron. Needing to overturn a nine-point deficit, Black_Flag_11 did at least cut it down by three points, but it isn't enough to reach the semi-finals. Of course, those seeds were set a while back, so you could argue that it is actually 5th overall against 4th overall, and 9th overall facing off with 2nd overall. - For the second year in a row, both the #5 and #8 seeds have made it as far as the semi-finals, while this is the first time either #2 or #4 has made it to this stage. - As of yet neither the #3 nor the #7 seed have reached the semi-finals. - Both finalists from 2016 are absent from the semi-finals this year. - Additionally, neither seed (#1 and #6) that reached the final in 2016 has made it to the semi-finals this year, meaning we are guaranteed a new combination in the final. - For the second year in a row, nobody below the #8 seed has reached the semi-finals. In other words, if you want to make the semi-finals next year you need to be seeded somewhere between #1 and #8, but not #3 or #7. Edit: as In Singapore, I'm changing to match my Pick 10 top 3 picks. Last edited by TypingChicane on Fri Sep 29, 2017 3:31 pm, edited 1 time in total. It worked out so well for me the last time! 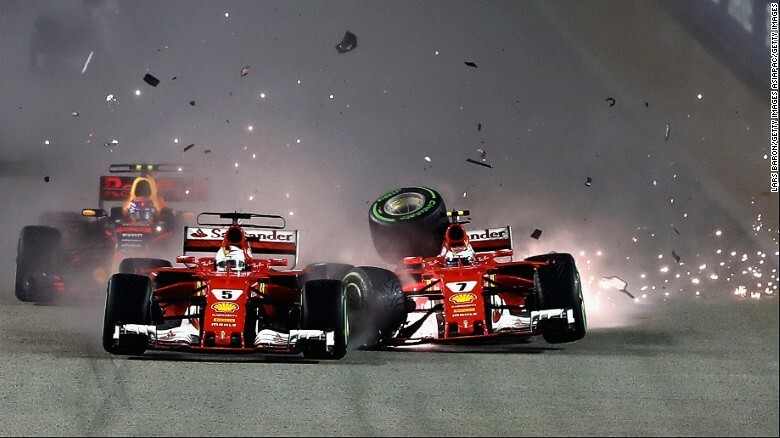 I'm going to risk sticking with Lewis and Mercedes doing what Ferrari did in Singapore and sorting out their issues overnight. Ditching Bottas for Max though and I'm gambling it rains so bumping Max over Seb. Probably too many gambles again but got to try something at this point. I'm a bit torn on this one like I'm sure many. I think Merc now have a generally faster car than Ferrari. I also think the track suits their car better. I also think they can fix most of their pace by tomorrow. Friday speaks for itself however. 2.5 seconds back in FP1 and 1.4 back in FP2. I think the ultimate difference for me will be that Vettel has won here four times to Hamilton's solo win. Putting Max in as I think it is going to rain. I'm back from traveling, but I have stuff to do. Update will be coming out tonight! Nobody scored more than 3 points, so there won't be a whole lot of movement. Delayed results, so these will be pretty bare bones. mcdo is still the championship leader, but the gap has narrowed to a single point from TypingChicane. Jezza13 and Icemanjee1 move ahead of Exediron; other positions remain the same. For the teams, Jalopy Racing extends its lead with the highest score this round. No Limit Excedrin Racing loses a place to McLotus, and Mind Your Manors loses one to Drive Sauber. Japan is coming right up, so let's hope for the return of some high scores! It's getting tight at the top!